As Andrew Scheer kicks off the Tories’ convention in Halifax, Maxime Bernier walks away from the Conservatives. Conservative Party leader Andrew Sheer speaks to reporters on Thursday about Bernier's exit. Rogue MP Maxime Bernier officially left the Conservative Party of Canada today. From a press conference in Ottawa, Bernier announced his official resignation to say that he's starting his own political party. He’s already accepting donations. The announcement came as the Conservative Party kicks off its three-day national policy convention in Halifax. 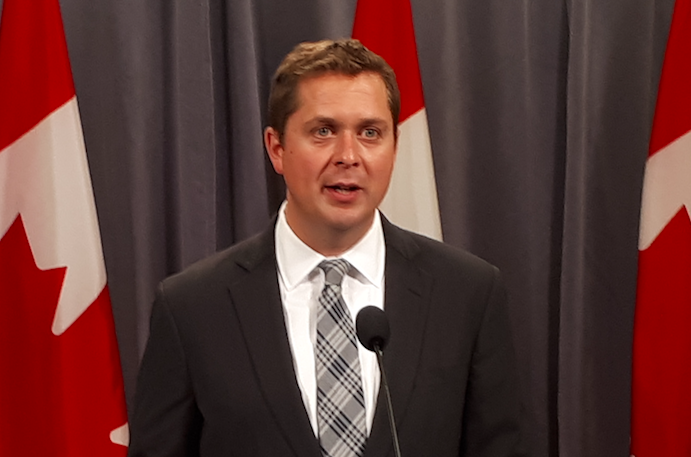 Leader Andrew Scheer told reporters after Bernier's announcement that he was disappointed the former Party member didn’t set aside his personal differences. Bernier was planning this for a long time, claimed Scheer, who lamented that the decision to leave will benefit prime minister Justin Trudeau more than Bernier. Still, Scheer insisted that Bernier's leaving would not hinder the Party's chances come next year's federal election. But reaction on the ground from visiting Tories was mixed. Waterloo electoral district association (EDA) president Michael Ben says he’s worried about the potential split Bernier’s leaving could cause. Ben, however, is confident all the members of his EDA will remain part of the Conservative Party, even if Bernier is successful in his plan to run a candidate in all electoral districts in Canada. Even if the Conservative Party does not lose any more prominent MPs, however, it's likely Bernier's new party is going appeal to a broad swath of what is, at the moment, the Conservative base. There are a lot of right-wing voters who might be looking for a new home if Bernier can get his party off the ground: disenfranchised voters interested in what they feel is the diminishing power of ‘old stock’ Canadians or Quebecois de souche; libertarians who want to get rid of supply management; and voters of the ailing Bloc. Depending on how the policy votes go this weekend, the more socially conservative could also be looking for a new home. It remains to be seen if Scheer can find a way to appeal to voters that a lot of Canadians find distasteful, in a way that doesn’t drive his moderate supporters to vote for other parties.